Precious metals futures were mixed this week. Silver and palladium were the only winners. Precious metals futures declined on Friday and for gold, that cemented its first weekly loss in seven weeks. Silver, meanwhile, still extended its weekly winning streak to seven in a row. Gold for August delivery shed $4.80, or 0.4%, to settle at $1,327.40 an ounce on the Comex division of the New York Mercantile Exchange. "Investors are taking profits, but $1,300 is now a floor for gold and that is going to hold moving forward," Reuters quoted ING Bank senior strategist Hamza Khan. "Eighteen analysts and traders took part in this week’s survey, and no viewpoint captured a majority. The biggest camp — seven votes, or 39% — looks for prices to ease some more. 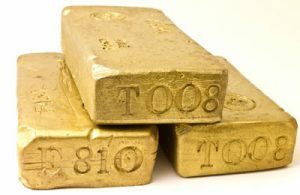 Six survey, or 33%, respondents look for sideways action, while five, or 28%, called for gold to rise. Meanwhile, on Main Street, 1,064 participants submitted votes in an online survey, the highest participation rate since mid-April. A total of 738 respondents, or 69%, said they were bullish for the week ahead, while 217, or 20%, were bearish. The neutral votes totaled 109, or 10%." Elsewhere, silver for September delivery shed 15.7 cents, or 0.8%, to settle at $20.165 an ounce. Silver futures edged up 0.3% this week, increasing their advance this year to 46.1%. As recently as Wednesday, they closed at $20.413 an ounce for their best close since July 30, 2014. October platinum fell $10.20, or 0.9%, to $1,094.40 an ounce, dropping 0.6% on the week. Palladium for September delivery declined $3.70, or 0.6%, to $647.40 an ounce, but still logged a 4.9% weekly gain. Both metals are higher on the year to date with platinum up 22.5 % and palladium up 15.2%. Gold added $3.40, or 0.3%, to $1,327 an ounce. Silver fell 11 cents, or 0.5%, to $20.14 an ounce. Platinum added $7, or 0.6%, $1,092 an ounce. Palladium was unchanged at $645 an ounce. For the week in London bullion, gold declined 2.1% while prices for the other metals gained — 2.1% for silver, 0.9% for platinum and 6.4% for palladium. Gold coin sales advanced 10,500 ounces after rising by 12,500 ounces last week. The weekly splits include 9,000 ounces in American Gold Eagles compared to 9,500 ounces previously, and 1,500 ounces in American Gold Buffalos compared to 3,000 ounces previously. Silver coin sales advanced 445,000 ounces after climbing by 250,000 ounces previously — their lowest weekly total of the year. For a fourth week in a row, all sales came from American Silver Eagles. The U.S. Mint set this week’s allocation of American Silver Eagles to 3,649,500 coins. Bullion distributors ordered 12.2% of them. Demand for 2016 Silver Eagles has slowed sharply in the last few weeks but their sales are still tracking a record. Their year-to-date total of 26,945,500 coins is 10% higher than the amount sold through same time in record-breaking year 2015.